Mrs May tells MPs it's a "historic moment... there is no turning back"
The EU's Donald Tusk says "missing you already"
On Thursday the government will publish details of its Great Repeal Bill, which aims to end the supremacy of EU law. The bill will also incorporate existing EU legislation into the UK statute book. 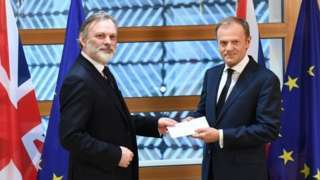 That will be the sequel to a historic day, as the UK formally gave notice of its departure from the EU by invoking Article 50 of the Lisbon Treaty. 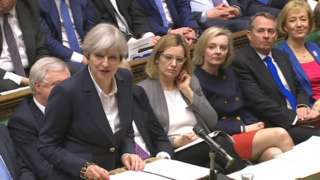 Laura Kuenssberg asks whether Theresa May is fooling herself or does the PM have reserves of political magic as yet unseen? Is UK trade with the EU declining? UKIP leader Paul Nuttall said: “At the moment we’re doing less trade with the European Union year-on-year - more with the rest of the world”. The overall value of the UK’s trade with the EU has increased in most years, but if we take trade with the EU as a proportion of the UK’s total trade, there has indeed been a moderate downward trend since its peak in 1992. However, it’s not a completely consistent pattern. In some recent years the proportion has risen, the year-on-year changes have been fairly small, and trade with the EU is consistently around half of the UK’s overall trade. Jonathan Bartley, the co-leader of the Green Party, referred to an ongoing case in Dublin, which is seeking to refer to the European Court of Justice the question of whether the triggering of Article 50 can be reversed. We looked into the issue of whether the UK can change its mind on Article 50 here . During his interview with Andrew Neil, Jeremy Corbyn said he was against a second referendum on Scottish independence because “there is a £15bn gap between Scottish taxation income and the requirements of Scottish public services”. That is essentially the gap between how much the Scottish Government spends and what it raises through tax. Scottish government statistics say the Labour leader is right. In 2014-15 Scottish public sector revenue was estimated at £53.7bn - the equivalent of £10,000 per person, and about £400 per person lower than the UK as a whole. Meanwhile, total expenditure by the public sector was £68.6bn. Overall, that’s a gap of £14.9bn between revenue and expenditure. First Minister Nicola Sturgeon has insisted the "foundations of the Scottish economy remain strong" and that “Scotland's long-term economic success is now being directly threatened by the likely impact of Brexit". Liberal Democrat leader Tim Farron is talking about the second referendum his party wants to hold on the terms of the Brexit deal. 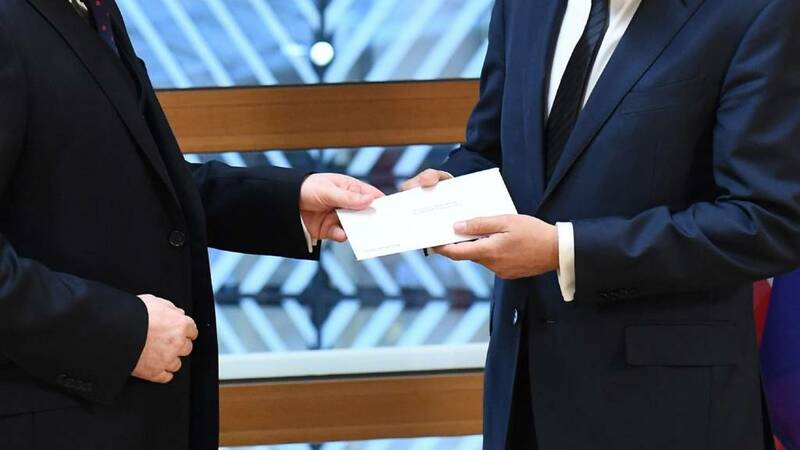 This is constitutionally possible, but the government has no plans to hold one and the question of whether Article 50 is irrevocable is the subject of legal dispute. Lib Dem Tim Farron says the good news for those who are "sad" at Article 50 being invoked is that the European Parliament has confirmed it can be revoked inside the two-year window. He claims this has thrown a "parachute" to the UK. Among the least equal in Europe? Jeremy Corbyn says: "We have great levels of inequality in Britain – amongst the greatest in Europe." The most widely used measure for income inequality is the Gini coefficient. On that measure, the UK is doing better than 15 other EU countries, and worse than 12 others. Inequality is greatest in Bulgaria, Cyprus, the Baltic states, Portugal, Romania, Greece and Spain. The most equal countries are Slovenia, Sweden, the Czech Republic, the Netherlands, Belgium and Slovakia. Jonathan Bartley, the joint leader of the Green Party, says that if Theresa May is serious about uniting the country she would not be pursuing an "extreme version of Brexit". He says he is "passionate about free movement" and will "defend it to my dying day". he adds that no one has mentioned climate change, which he says is the biggest issue facing families, in today's debates and statements on Article 50. UKIP leader Paul Nuttall, whose party is the self-styled "guard dog of Brexit", says he saw "very little" to disagree with in Theresa May's statement earlier. But he says that "when it comes to walking the walk", the PM "generally fails", claiming things like fishing rights could be "bartered away". Theresa May predicts more decision making for devolved nations post-Brexit in her Article 50 letter. Moving on to other party leaders now. Lib Dem Tim Farron defends his call for another referendum - this time on the terms of the Brexit deal. We do not know what the deal will look like and the people should not be forced to accept a "stitch up", he says. On the question of Scottish independence, Jeremy Corbyn says things "could get a bit complicated" if a referendum takes place at the same time as the Brexit negotiations. 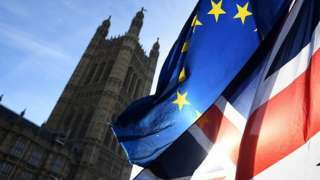 If one takes place at all, it would be better for it to be "after Brexit negotiations have been completed," he says. Labour will be "working out a policy proposal" on immigration, Jeremy Corbyn says. Does he agree with that shadow home secretary Diane Abbott that free movement is a "worker's right"? He says they both want to end the "grotesque exploitation" of migrant workers. Scary clowns, mad hatters and a giant-headed Theresa May. Just some of the fancy dress outfits worn by those protesting the triggering of Britain's exit from the EU outside the Houses of Parliament. "I felt like I needed to come down and remind Parliament, the British public and the world that we are not willing to put up with having Brexit", Eddie Spinx, whose been standing outside Downing Street shouting from a megaphone all day, tells me. A group of UKIP members all smiles and brightly dressed in purple are celebrating. "I feel very happy", one tells me. "The divorce settlement is zero maintenance", adds another. We've still got two years until we actually leave the EU - and at the moment no signs here of the two sides coming together. Jeremy Corbyn dismisses claims of a £50bn payment from the UK to leave the EU - he says he does not know where the figure comes from. Labour will be holding the government to account "all the way through", he says, and he rejects the idea of a second referendum. "We want to be able to speak for the entire country," he adds. Is he enthusiastic about Brexit? "Brexit is happening," he replies.